Day 17 – Ask for Help! 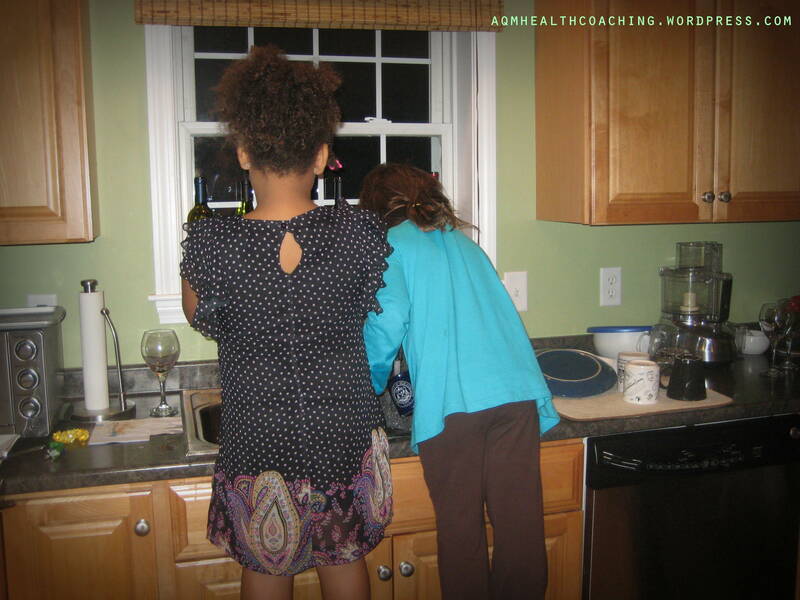 Two of my nieces washing dishes after a big family party. For our 17th day of 31 Days of Healthy Ways to Enjoy the Holidays More the tip is to ask for help with housework and errands. You have more on your plate during the holidays. We’ve already talked about how full your social calendar and to do list is. Asking for help with it all is another strategy you can use to get through the season (and all year long). Let me tell you something. You are not a martyr. You don’t have to do everything on your own. No one gets a prize in heaven for doing the dishes every night. You will be more effective if you aren’t spread so thin. You will reduce your stress levels and you’ll be less likely to deal with your frustration by throwing yourself into a box of donuts. Ask your friends, kids, husband, coworkers or anyone else in your life for help. You’ll be amazed how most people actually want to help when you ask. When I was 9, I was helping my Dad install sheetrock in our garage and at 11 I was tall enough to reach the brakes in the car so I would help bleed the brakes when he was working on our station wagon. My sisters and I even helped Dad install a new well when ours crapped out. My parents had 5 kids and needed us to pitch in to get by. I wasn’t a huge fan of these chores as a kid but now I appreciate all my parents made me do because it made me into a person who you can count on to get things done. Not a bad trait to have. There’s no reason why the kids can’t help out with chores around the house. Even young kids can help clean up after themselves. Your preteen can do the dishes and your kindergartener can feed the family dog. Your 8 year old can bring in the mail after school. The Happy Housewife has a great printable chart for age appropriate chores for kids. Not only does it help you out, but you’re also teaching your kids valuable lessons about responsibility that they’ll need as an adult. So important! If the kids helping out isn’t enough and your budget allows it, think about hiring a cleaning service to come in to clean once a week or every other week. Rates average $25 – $40 an hour to have someone vacuum, dust, clean the bathrooms and more. Think about how many hours you spend cleaning. Wouldn’t it be nice to come home after a busy day and someone has already taken care of it? If you go out for lunch at work everyday and switch to brown bagging it (which is better for you anyhow), you’ll now have the cash needed to pay for cleaning help. Ask a neighbor to pick up the kids from basketball practice. Ask a friend to pick up a prescription for you. Ask your husband to pick up a healthy take out for dinner. Ask a coworker to proof a presentation for you. If someone you cared about asked you for help, wouldn’t you say yes? Exactly. Do it. You’ll feel so much better and they’ll feel good for being able to help you. This entry was posted in Healthy Tips and tagged 31 Days, Healthy Holiday Tips, Stress, Support on December 17, 2013 by Andrea Quigley Maynard.